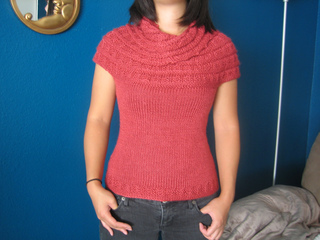 Harmonia’s Rings has grown… into a tunic sweater! After many requests, the Harmonia’s Rings Cowl has been re-engineered to fit seven sizes. The addition of a fitted body to the drapey yoke makes a world of difference! Because of the drape of the yoke, this design accommodates a wide range of body types. Wear it alone or wear it layered… the perfect compliment to your wardrobe through the seasons. Many thanks to my technical editor, Jeane deCoster, and to my many test knitters. Add this last line to that section: On last round, increase 0 (2, 0, 0, 0, 2, 2) sts somewhere in the round - 132 (156, 160, 184, 196, 208, 220) sts.